IT arced and screamed like an unanswerable Roger Federer topspin forehand, a moment of pure invention that moved beyond the established bandwidths of achievement. Conor Hourihane had stood over the free-kick for fully two minutes as a monsoon of tennis balls – sufficient to sustain several marathon Wimbledon five-setters – rained down in an unstoppable deluge from the southern end of the ground. Mick McCarthy, who had cautioned against such an anti-John Delaney, anti-FAI tactic, insisting it would not help his team, was dressed in a face of thunder. He might have been John McEnroe on the cusp of one of those volcanic "You Cannot Be Serious" eruptions. Seconds later, the Irish manager was beaming, beatific, wheeling toward the steepling bleachers, punching the air in triumph. The changing weather of McCarthy’s Yorkshire features eloquently told the story of the night. Hourihane, with the very first kick after the protest McCarthy feared would hinder his team, had planted a headstone marker on 18-months of Irish football gloom. It is such a long time since Irish football had anything resembling a beautiful sheen to its coat that the Corkman’s moment of exquisite performance art is worth reliving. In 2006, the writer David Foster Wallace wrote a lyrical essay entitled "Roger Federer as Religious Experience." He marvelled at one shot with which Federer had utterly confounded Andre Agassi: "It was impossible. It was like something out of 'The Matrix'…I was down on one knee and my eyeballs looked like novelty-shop eyeballs." Hourihane’s killshot, curled with his left-foot, the murderous velocity leaving Giorgi Loria stretching helplessly like a commuter desperately stretching out his arm for a 46A that’s already halfway to Dun Laoghaire, provoked a similar reaction. The goal was very good, that it arrived in that first post-protest palpitation rendered it transcendent. It felt like the bailiffs evicting the last fetid droplets of O’Neill-era doom and gloom. In one act, all that negativity and angst, all those snoozefest nights of fear and loathing, were evicted. And the Aviva was rocking like it was 2001 and Roy Keane had just tattooed his stud-mark into the leg of Marc Overmars. It was so long since an Irish football night had felt this way that not everybody will recognise the emotion: Joy. Unadulterated, 100% proof delirium. The usual health warnings apply. It was only Georgia. Darren Randolph had to make another stunning point blank save. Georgia hit a post in the 85th minute. Ireland converted just one from, maybe, 20 chances. But there was a vim and adventure and a fizz to Ireland’s play that was unrecognizable from those darkest hour days of 2017 and 2018. James McClean tore down the flank like a gambolling colt, Hourihane probed classily; Glenn Whelan, in his 36th year and apparently pensioned off by O’Neill, offered certainty at the base of midfield. A sizeable, though well below capacity crowd, bayed their approval. The outstanding David McGoldrick departed to a rapturous standing ovation. It all felt redemptive, a reawakening, like the end of Irish football's recession. When McCarthy last walked into this arena as Irish manager, it was still the ancient, ramshackle Lansdowne Road. That night, 17-years-ago, the old fortress seethed and rasped; decency held its nose at the befouling stench of pernicious Saipan wounds spitting out their toxic ooze. 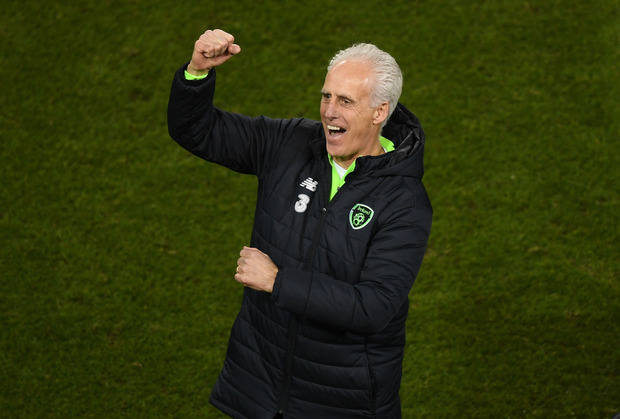 Ireland were the home team that poisonous October eve against Switzerland, but, as he was taunted and ridiculed, McCarthy knew what it was to be behind enemy lines. A nation scarred and split and high on indignation stormed the bear pit and chanted his nemesis, Keane’s name. McCarthy understood he was thrashing helplessly in a feral tide of recrimination. He melted into tears as he left the dressing room after a 2-1 defeat, the mask of sturdy Barnsley granite disintegrating. That the tribal loathing had come from his own clan wounded him intensely. Within weeks, he was gone. If the door closed on his old life that night, then, just under 6,000 days later, he found himself again in possession of the keys to this towering corner of Dublin Four. If the Aviva was a comparable island of hostility to the rancid 2002 terrain, McCarthy was no longer the target. Rather, the latest chaotic FAI squall – the gone but not yet really gone John Delaney rumpus - felt a little like the throbbing from a rotten tooth. "Stand up for Delaney Out" came first. Then, came the cannonade of tennis balls. Then, up stepped Hourihane for his Federer moment. And, for the first time in many moons, Irish football, if not its besieged executive vice president, remembered what it was to smile.